Manchester-by-the-Sea is one of those movies I sometimes hesitate to see. I am pretty sure I am going to like it, but in a crowded field of really good movies, which ones do I want to give up to see this one? 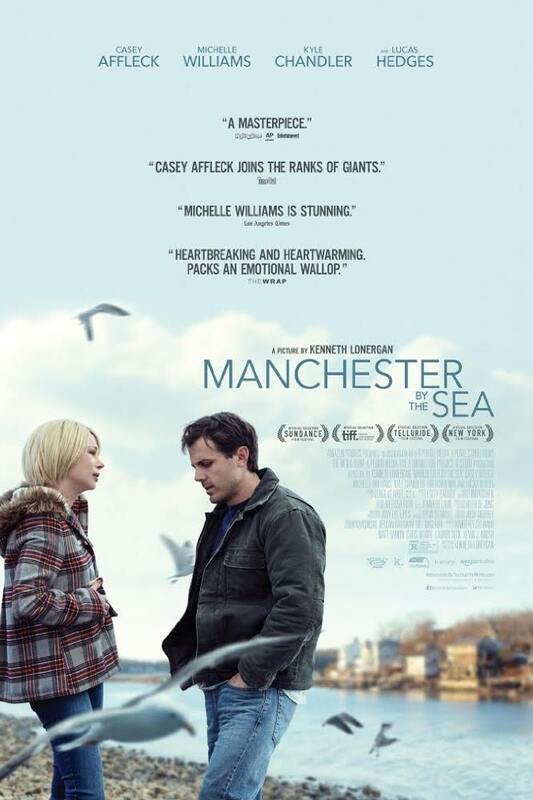 Well, Manchester-by-the-Sea was well worth the time, and it’s earned its spots as a nominee for academy awards for Best Picture, Best Director, Best Actor, Best Supporting Actress (Michelle Williams, Brokeback Mountain, Shutter Island), and Best Original Screenplay. The movie is a gritty, compelling, down to earth story of tragedy and heartbreak that still sits in my brain, propelled by fine, grounded film making and exceptional acting. Written and directed by Kenneth Lonergan (Gangs of New York), the story is set in New England and focuses on Lee Chandler (Casey Affleck, The Assassination of Jesse James, Gone Baby Gone, The Finest Hours) a handyman in Quincy Massachusetts who returns to his hometown of Manchester-by-the-Sea when his brother Joe (Kyle Chandler, Friday Night Lights, Bloodline) dies from heart failure. He finds that Joe has assigned him guardian of his teenage son, Patrick (Lucas Hedges, Moonrise Kingdom, Kill the Messenger). Lee is forced to confront the challenge of parenting a teenager and demons of guilt from the tragic loss of his children years earlier. He also must face the legacy of the tragedy that still lives in the memory of the townspeople, as well as Joe’s friend and partner George (C.J. Wilson). The story starts out slow, as films of this nature tend to do; they are not action films. But the characters and story grip the audience as soon as Lee Chandler returns to his hometown. The story is complex and layered, with the screenplay providing a textbook example of how to reveal only what is absolutely necessary to keep the audience engaged, leave enough unsaid to maintain tension, and provide just enough information to keep the pace moving forward. Lonergan does an excellent job of splicing in flashbacks at just the right moments to enrich the plot and reveal the intertwined lives of the characters. We learn why some relationships are tenuous, some are frosty, and others are too hurtful to confront. The audience, however, is never overwhelmed with their complexity and layers. It’s a poignant but real story, and Affleck leaves no doubt that he owns this film although the supporting cast is also superb. Central to the story is whether Lee can put the defining tragedy of his young life behind him. Other characters have found ways to forgive him and move on, but Lee struggles. Affleck deftly shifts from happy go-lucky young husband to self-loathing, guilt ridden wreck, but plays the part with a balance and reserve that keeps the audience rooting for his recovery. Viewers might leave the film a bit disappointed because it lacks a clear resolution. Then again, this is a story about real life, not fantasy. Manchester-by-the-Sea has earned more than $50 million since its release in mid-December 2016, an astounding and well-earned return on its $8.5 million production budget. Producers Matt Damon and Chris Moore (among others) have proven once again they have a knack for finding a compelling story that can become a gripping movie without a big budget or A-list actors. This movie, however, might be the vehicle to put Casey Affleck back on the path to the A-list. This entry was posted in Film Reviews, Films and tagged 2016, Casey Affleck, drama, Manchester-By-The-Sea, matt damon on February 8, 2017 by SR Staley.